A dishwasher is a kitchen appliance that everyone needs, no matter if you're a one-pan recipe master or you live on your own and have minimal washing up. They can, without a doubt, be handy for those days when you just don't want to wash up after yourself, or if you're having guests over for dinner; and freestanding models easily slot under worktop space in your kitchen. Check out our pick of the freestanding dishwashers for your kitchen. If you're looking for more kitchen appliance recommendations, head over to our hub page. The majority of dishwashers made as freestanding units are usually no wider than 60cm and stand a little below your kitchen countertop level. If you’re looking to save space or want to keep a certain aesthetic appeal to your kitchen, you can also get integrated dishwashers that are designed to sit behind a façade that matches your kitchen cupboards. If you're a family of five, you're going to want a dishwasher that's on the larger side, has a few racks and can fit a fair amount of kitchenware in, so you're not having to put it on several times a day. But for those who are a couple or live on their own, a smaller model will do fine, or you could even consider a slimline dishwasher if you're being really space-savvy. How many speed settings does the dishwasher have? It's worth checking if there's a quick wash option on your new dishwasher, and how long it takes. It's also worth noting how many different settings there are, which can be useful for those who own nice kitchenware that needs to be delicately washed, or for those who prefer an EcoWash. How noisy is your dishwasher? It's also worth thinking about how noisy the dishwasher is, especially for those who live in a flat or their bedroom or living room is right by the kitchen. Ranging from D to A+++, the latter being the better, your utility bills will definitely thank you later if you get a machine which is towards the energy efficient side. Also, some dishwashers have Eco-Wash settings which although may take longer, will save you money in the long run on your bills. Dishwashers can range from £200 to £1,000 (and sometimes beyond), but the more expensive they are definitely doesn't mean they're better. Depending on their capacity and energy rating, be sure to choose one which suits your needs best. Need a new dishwasher but don't fancy spending your entire month's wages on a decent one that'll last? This Hoover model is currently our top pick of the best freestanding dishwasher you can buy for your home. 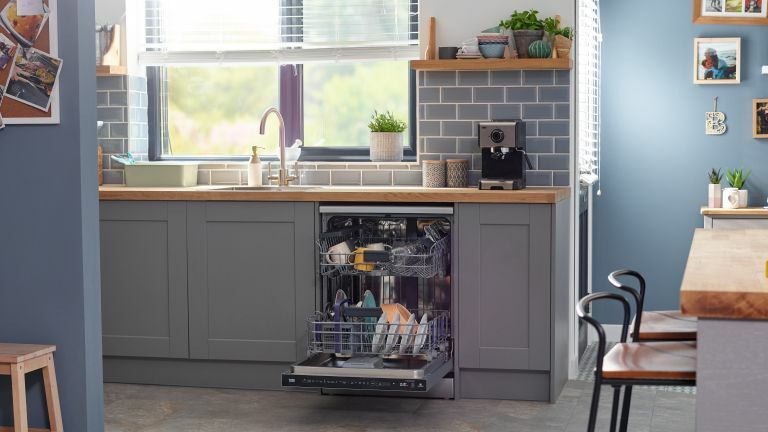 Not only does it have 16 place settings, nine programmes and a 24 minute rapid wash cycle, but it can also be connected to your phone via an app, so you can control it when you're out of the house (or just sat on your sofa in another room). It has a night programme, so that if you like to put your load on before you go to bed, the noise of the machine won't wake you up, and during the drying cycle, the door will automatically open slightly to circulate air in the dishwasher, letting your dishes part air dry. What's more? For those who are eco-conscious, there's a SuperEco setting which provides an average energy and time saving of 25 per cent, depending on the wash cycle. Thanks to the Beko HomeWhiz app, the possibilities with this smart dishwasher are endless. It's compatible with Alexa, for a start, so whether you can't be bothered to move from the sofa or you're at the office, you can turn on the dishwasher with your voice or your smartphone. Thanks to its AutoDose software, the dishwasher can hold up to a month's worth of detergent and for each wash it'll dispense the right amount needed. Other features to note are its AquaIntense function for heavily soiled dishes and the SteamGloss programme for shiny glassware. The app notifies you when the salt needs replenishing or the filter needs cleaning, and it lets you store your favourite tailored programmes in a tab so they can be easily chosen. For smaller households, there's a half load option and it has eight other programmes including eco, baby and intensive. The best freestanding dishwasher for those who lead busy lives and want something smart to keep up with the times, we think. If you're looking for smart at a realistic price, this dishwasher from Bosch ticks all the boxes. Those worried about water bills will be pleased to learn about its host of efficiency features. There's ActiveWater, which enables the dishwasher to use less water while increasing performance, and AquaSensor, which ensures the dishwasher is never using more water than it needs. With a host of automatic settings to choose from and a glass 40 degrees protective program, you'll never have to worry about ruining your best wine glasses again. Our only complaint? There's no audible alarm to alert when it's finished cleaning, but if you can look past that, it may just be the perfect dishwasher for you. If you have a big family, the last thing you want to do after cooking for everyone is then wash up after them. With this dishwasher, you can load everything up and let the machine use its ActiveWater Technology to do the hard work. The door has a child lock preventing little ones from accidentally opening it mid-cycle and causing a flood, and you can load up to 132 items in one go. The trays are a little small, but as long as you don’t over-stack, it works a dream. It even has a load sensor so it will use less water when it is not completely full. Win win! This is our top pick of the best freestanding dishwasher for family households. This slimline dishwasher has a super silent option, meaning it won't wake the kids - result! The standout feature on this dishwasher is the duoPower® double spray arm, which gives fantastic cleaning results thanks to better water distribution. Another great feature is the emotionLight, which makes two LEDs switch on automatically when the door is opened, a great little feature when you’re grappling about in the dark. There’s a special cycle for glassware, an extraDry option that extends the drying phase (perfect for plastic) and an anti-fingerprint stainless steel finish.